The Rifle Paper Co. has exhibited at National Stationery Show (NSS) just once, but that fact doesn’t seem to be standing in the way of its triumphs. The line is distinguished by its sweetly whimsical imagery, as well as its signature illustrated couple scene invitations, all fashioned by Creative Director and Co-owner Anna Bond. The radical idea of putting the engaged pair on their wedding invitation, coupled with the unmistakable uniqueness of all the company’s output, established Rifle as an instant favorite amongst nearly anyone who encountered it, be they blogger, magazine editor, stationer or most importantly, end consumer. As a result, the growing company has partnered with Chronicle Books to create a notebook collection and stationery set, to be introduced at NSS this year. Meanwhile, Anna – sometimes in the company of husband and co-owner Nathan, sometimes solo – has received priceless publicity everywhere from the hip online Matchbook Magazine, to the more mainstream Country Living and the “Do What You Love” video series promoting Gap’s 1969 Jeans Collection. So before Anna becomes any more of a stationery success and pop culture fixture, Stationery Trends thought it best to find out a little bit more about her inspirations and where she’d like her business to take her. ST: After studying graphic design, you worked as both an art director and freelance designer/illustrator. Then, when you designed wedding invitations for a few close friends, you decided to make it your business. What was it about the process that brought you to that decision? AB: I’ve always loved stationery, but it took me a few years to realize that it was the perfect medium for what I really loved to do, which was both design and illustrate. It just sort of clicked when I started creating the wedding invitations, and I never looked back. I love the whole business aspect of it, too. I’d known that I wanted to start my own company, and I’ve really learned how to produce, market and promote the line, which is so vital for any creative idea. ST: When did you and Nathan marry, and how did your own wedding invitations reflect who you are as people and a couple? AB: Nathan and I got married in July 2008. I had designed a few wedding invitations beforehand, but ours was the first that was fully illustrated with us as a couple and a scene (the style that people started to know us for). It was just something I pictured as being totally unique to us and really fun. I wasn’t into the standard traditional invitation, and felt like the invites should really showcase our personalities and give a hint to the style of the wedding, which was laid back and festive. ST: You have both a studio and storefront. Who are some of your top-selling vendors, and what sort of criteria do you have in evaluating new ones? AB: We primarily carry our own line in our storefront but we also carry Saipua soaps, a selection of unique books, Carta Inc. ribbon, handmade scissors from India and so on. My criteria for products is simply that I love it, it’s unique and somehow fits in with the Rifle Paper Co. aesthetic. It’s a bit of a hodgepodge assortment but I love it that way. I’ve also tried to include goods that you can’t find anywhere else in our area. ST: What have you learned about running a store that’s affected the product you create? AB: The shop has given me a better understanding of how our cards work in the store environment, such as how they look sitting on a shelf and what designs jump out at you from across the room. Sometimes it’s hard to get that perspective from a computer screen or an inventory shelf. I also have a better understanding of how orders are placed and what questions that I have from the vendors I buy from. I think that’s allowed us to be even better at our jobs as we work with our own vendors. We really try to be as accessible, friendly and easy to work with as possible and put a huge emphasis on customer service. ST: You’re in the process of developing personalized wedding invitation templates for your storefront. Can you explain what they are and how they work? 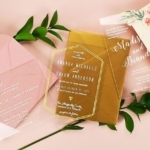 AB: We’ve had so much great feedback from our custom invitations that I wanted to offer a wider range of options that can be available to more people. I’m developing invitation sets (and day-of pieces) that are a high-end customizable option for couples and range from whimsical to elegant. 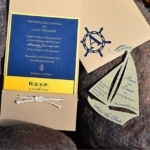 We’ll also have sets that include our signature illustrated couple scene invitations. Right now we’re working with brides on a by-request basis, but we’re planning on launching our wedding collection and corresponding website this spring. ST: You’ve run your entire business completely credit- and debt-free, which is a big departure from how most companies traditionally operate. What made you adopt this approach, and what have been its benefits and shortcomings? AB: We started out that way, but don’t feel that it’s appropriate for every business or even that it’s something we’ll adhere to. It just happened that way from the start and allowed us to feel confident about what we were building. We definitely want to continue to grow the brand, and while we try to run our business the best way possible, we know there are risks that you inevitably have to take in order to succeed. We’ve really worked hard to find that balance and will continue to be very careful and calculated about how we grow. AB: My typical day starts with coffee (very important), and I usually get into the office around noon. I start off with emails and then work on various projects that range from new designs to personalized stationery orders to little things like designing new website ads. I spend a little bit of time managing our social networking, handling various requests, and working with our project manager to make sure we’re on the same page. At around 7 p.m. every night, Nathan and I meet to go over email requests and various business plans. We always talk about what the other is doing and what’s going on to make sure we’re always on the same page. After we meet I continue working on various projects until about 2 a.m., when I leave the office (I’m working hard to cut down those hours). AB: I try to be inspired by everything around me, but I’m probably most consistently inspired by fashion and vintage design. I also love looking at color, textile patterns, architecture, old films, interior design and book covers. Anything goes. Someone wisely told me that you should live life with a sense of childlike wonder, and I’ve really tried to adopt that sensibility in my life. ST: What advice would you give to new or young invitation designers looking for success in our field? AB: I would say work hard and be original. It’s so easy for anyone these days to print out some cards and sell them on Etsy. It takes a lot of extra work, planning and thought to create a new and interesting brand, and even more to keep it around. ST: Do you focus more on the creative side or business side? Is it hard to balance the two? AB: I focus mainly on the creative side. I do find it hard to manage both at times even though I love the business side as well. I enjoy planning, coming up with new concepts and marketing, but sometimes it can pull away from the creative a bit too much. Nathan really stepped in at the beginning to handle most of the business side, which he’s incredibly talented at. It’s a true team effort and we wouldn’t be where we are today without relying on each other. AB: I’d like to see us continue to grow and hope to establish Rifle Paper Co. as a quality, unique brand. I’d also like to expand our collection to include even more products and would love to collaborate with other companies on fun projects. ST: What other stationery designers or companies do you admire? AB: I love Kate Spade stationery for Crane, Egg Press and Elum. I think all three have really unique styles that I love. I admire a host of (others), but one that always stands out is Kate Spade. I just love their aesthetic and I’ve always admired the way Kate and Andy Spade started their company and ran it as a husband-wife team. I also admire Martha Stewart for being superhuman and creating such a successful and consistent brand. AB: We’re incredibly grateful for the positive response our line has gotten so far. We know we’re still young and new but we can’t wait to share more and are so excited about what’s to come! A. Paris in the ’60s, please! Q. How would you define your signature style? Is there a piece in your line that epitomizes it? A. Whimsical and nostalgic. Our assorted folk set uses our signature colors and epitomizes our style in my mind. Q. What is new in your paper offerings for 2011? A. We’ve got some exciting new projects lined up that can’t wait to debut at the stationery show. We’re also collaborating with Chronicle Books on two stationery pieces (a stationery set and notebook set). Q. What one design or product from your 2011 releases do you think is really going to be hot and why? A. I’m really excited about our new journals. They’re playful, fun and something I’ve been looking forward to so I hope others love them as well. Q. Obviously any aesthetic is going to change over time. Which piece (or grouping) in your current line do you feel reflects the direction of your line? A. Again, the Folk Set. I think it’s a nice cornerstone in my mind. I feel like that set says a lot about who we are, where we’re going and what we’re all about. Q. Do you have a personal favorite from your current custom offerings? A. I love our dog cards. They’re a big hit and they’re just so fun. Q. What other designers, music and movies inspire you? A. Oh, that’s tough! I feel like I’m doing exactly what I love but I suppose I’d say interior design or architecture because I always find myself admiring buildings and find everything about them intriguing.